The seedlings we planted are looking very healthy and green, thanks to our slow-release organic fertilizers incorporated into our potting soil mix. A couple of squashes in one container are a little spindly - probably from not getting quite enough sun quickly enough. We were trying to protect them from this hot Florida sun and I suspect we went overboard. But, here it is, the end of July and we're planting vegetable seeds in Florida. The moisture is staying just about perfect in the pots. No daily watering, no nothin'. Just topped off the reservoir with the water/very-small-amount-of-VermPlex mixture only once so far. When the plants get full sized, we'll see how long the water lasts. For now, it's great, because the top of the potting mix isn't drying out and the moisture stays constant, so the seedlings are not suffering in the least. The slow-release quality of the composted manure/Pure Black Castings® mix, microbe-inoculated with VermaPlex®, is providing all the nutrients the plants need when they need it. 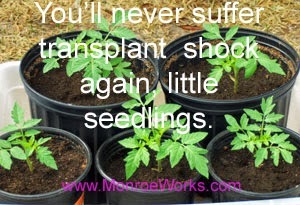 The microbes are making the nutrients available to the plant without burning, and will last the lifetime of the plant. 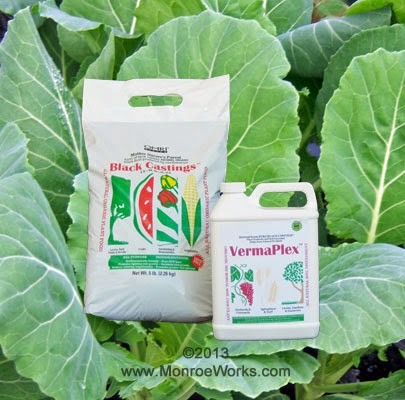 This means the fertilizer-for-vegetable cost of one 5 gallon container amounts to pennies for the 1.2 pound of black castings and the 8 ounces of VermaPlex®. We picked up some more plastic containers (8 gallons) from WalMart for $3.50, which is the cheapest we've found yet. 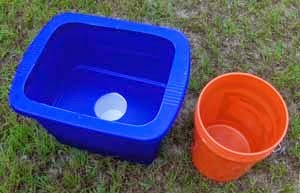 It only requires 1 container, because the section you cut from the middle of the lid fits down in the bottom for the reservoir (with a little support underneath). The recycled large butter cup is the perfect height to serve as the "wick". The rim of the lid will hold the plastic mulch in place. Perfect. It seems to be a serendipitous occurrence finding them. Remember the day-glow-orange ugly containers from Home Depot? Well, these new beauties have solved our decorating problem. Check it out. We're ready for the kick-off. Her Royal-Sheikyness (the horse, of course) insists...she's a little obsessed with the grass. As a matter of fact, pasture's pretty much her whole life. 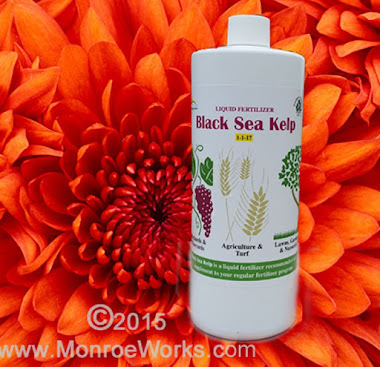 Pure Black Castings™: Certified Organic Worm Castings created using only organic materials. 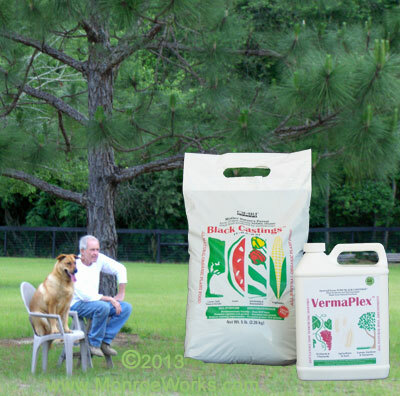 VermaMax®: Chicken Litter organically composted using VermaPlex®. VermaPlex®: Created from Certified Organic Pure Black Castings™. Innoculate your garden soil and your compost heap. Are Your Composting Materials Safe? News You Can Use and "The Sunday Funnies"
Certified Organic, OMRI Listed Worm Castings Based Fertilizers. 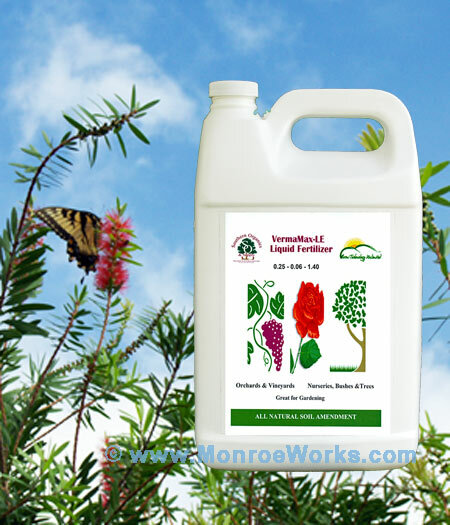 "The fertilizer nature intended." VermaMax LE® Now Available. For extra green and growth. Black Sea Kelp Now Available. An incredible 17% Potassium for blooms. Copyright Bill Monroe 2009-2015. Simple theme. Theme images by TommyIX. Powered by Blogger.